We live in a really great place, but there is no storage and no craft room for me, so the kitchen has become my workshop. As a result, my counter is insanely cluttered. I created this little beauty from a calendar frame and various recycled materials that I Mod Podged with my kiddles' artwork. I am planning on hanging this inside my coat closet door. 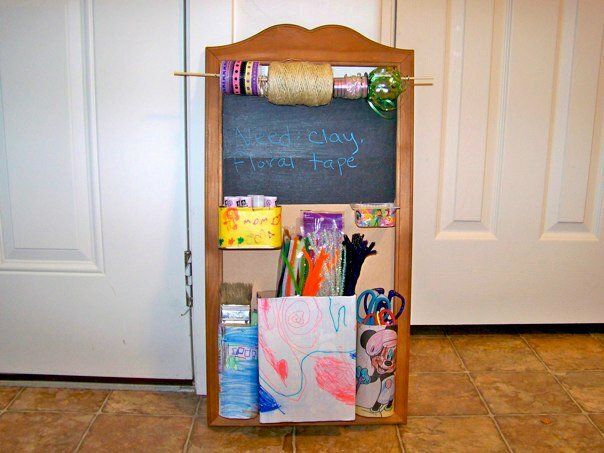 If you want a chalkboard on your art station paint the desired area and let it dry. I recommend 2 coats and I REALLY recommend covering your frame with painter's tape. I learned this one the hard way. Mod Podge the artwork onto your containers and allow them to dry. 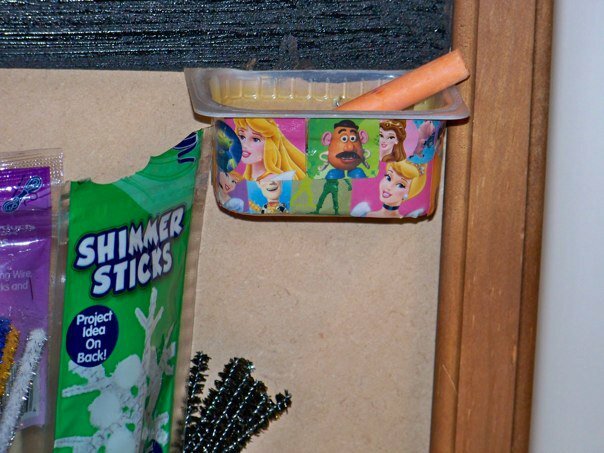 Staple the containers to your frame from the back. Push the staple tips flat with a screw driver. 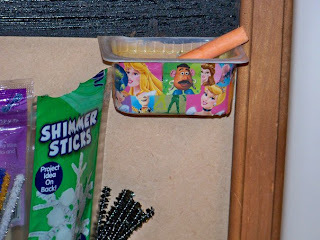 I had some trouble with the tin container, so I pushed holes in with a thumb tack where the staple just dented it. I then slid the staple in through the holes and pushed the tips down with a screw driver. To make a ribbon dispenser screw 2 eyelet screws into the frame across from each other and slide in the dowel or 2 skewers hot glued together. 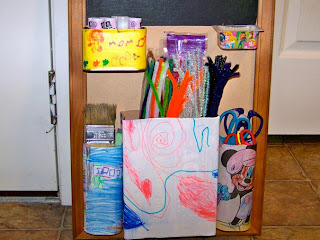 Add your art supplies, hang your station, and enjoy your new counter space! 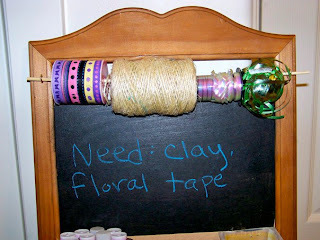 This is such a cute idea, although I don't have enough doors in my house to keep my craft stash on! I really need to get it sorted out, might use this as inspiration, thanks for sharing! No prob. 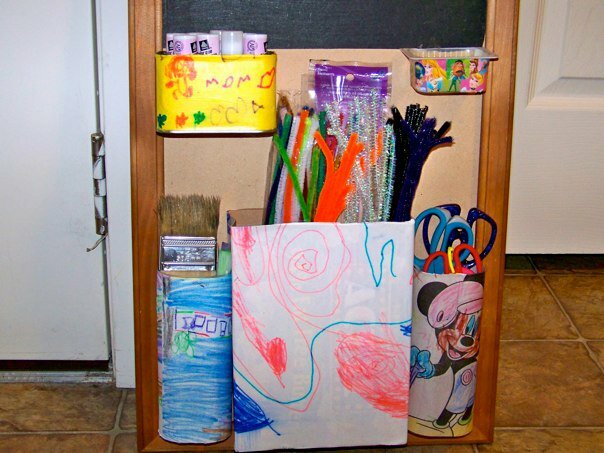 I have milk crates full of craft supplies stacked up, but this one is for the supplies I use the most with my kids. What a great idea...love it. Really cute. Love the hanging bar for the twine and ribbon. 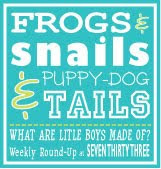 Thanks for linking it up to my Organizing Mission Link party! So clever! 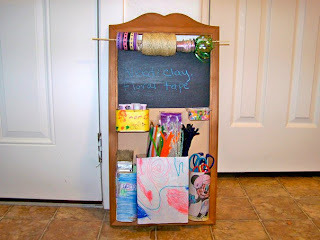 I love that you used your kids artwork and recycled materials for this handy organizer. GREAT JOB!